Today there is 73 years ago that allied forces jumped other the Rhine river in the area of Wesel, Germany. This operation called Plunder - Varsity was the last and the biggest airborne invasion of the second world war. This day, the 6th British Airborne Division and the 17th US Airborne Division were dropped on the battle field in one time ! At the end of the day, the Drop Zones et Landing Zones were secured and all the missions assigned to the 17th AB were accomplished. 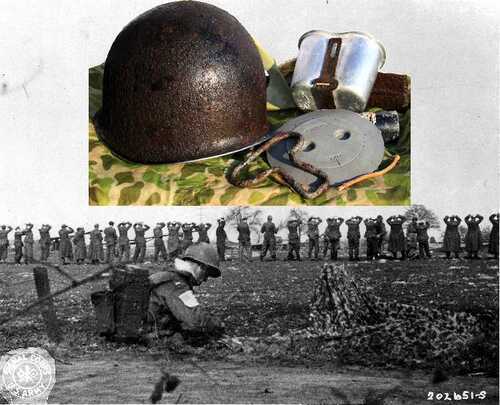 Forty-four days later, the German forces surrendered without condition ! On this pic showing a 513th PIR radio operator in his fox-hole, is presented some gun artifacts discovered on the Landing Zone N, in the area of the 194th GIR. There is a laundry on the liner but unfortunately not complete.